July is one of the months we live for in Seattle. The days are long, the sun is out, the lake is warm(ish). Many of us grab the season by the tail in a full sprint–I know I do! But I also know what I’ll be doing more of thissummer: PRACTICE. 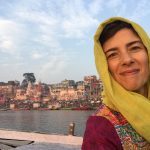 This past February I had a talk with my teacher while on retreat in India. I asked for help. He asked me a few questions about my practice, and then my previous summer, which had been a whirlwind of travel, lake swimming, fun with my family, and plenty of work and teaching in between. I sheepishly admitted that there wasn’t much meditating happening on those sunny summer mornings, and that I’d had to commit in this newsletter/blog to a minimum of fifteen minutes a day to get back to my practice in September. It became clear that I had a pattern. I let the sunshine and fun of summer nourish me, and distract me. This worked in the moment–I had energy, I had fun–but come autumn my reserves were depleted, just when work and home asked more of me. It was a bit of a train wreck, really. In India, where I meditated 2-3 hours a day, I connected deeply to the source of energy that comes from within, my inherent luminosity. When I practice, I remember that there is luminosity at my core. When I don’t practice, I forget, and try to draw all of my energy from the outside–from other people, from nature, from substances. We ALL forget, and that’s the reason for daily practice. This summer I have a commitment to daily practice–be it a class, home practice, or both. With my new focus of practice to remember my luminosity, rather than because I should, I have faith that it will follow me through the sweet months of summer, and support a juicy and enjoyable fall. Two great ways to summer-ize your practice: 1. Our Summer Special and 2. Yoga in the Park at SAM’s Olympic Sculpture Park, starting July 9. 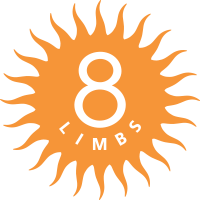 Lastly, please save the date for the 8 Limbs 20th Anniversary Party on Saturday, October 15. Each studio will have a morning celebration, then we’ll come together where it all started, 8 Limbs Capitol Hill, for an evening of performances, music, and this amazing community. We hope you’ll join us! This post is the Director’s letter of our July Newsletter. To subscribe to our bi-monthly newsletter click here.